Wicked cool. I like it. Great charcoaly effect. He needs to eat more! This is very nicely done, it does look like a charcoal drawing.. Listen to staci! This rocks. I agree.. you should draw a lot more. :-) I always enjoy your stuff. o wow... this is great. i love the way it is drawn, quite nice! Yes, draw more. Great stuff. Listen to them! This is turning out great, and it would look better with a little more stuff...prossibly a BG? This is Great, I love the look of it. Reminds me of old renaissance drawings. dude! thats awesome. im from fl, dude ritcheous tubular. you know, i dont think im even spelling those right dude. I love you, 'Mando. (Great use of halftones.) Draw more. Love when you do these kinds of pictures, they're just too cool... yep... too cool. 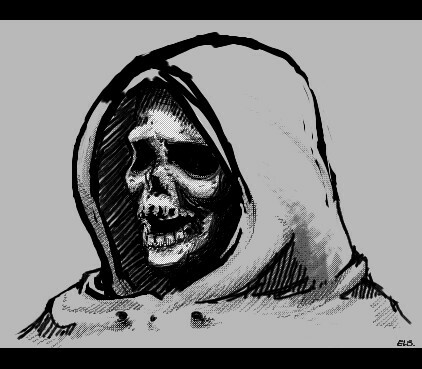 Heh, this is pretty cool.Really reminds me of my friend Alvaro's drawing.He drew a grim reaper that closely resembles this pic with his full cloak and scythe.It'd be cool to see someone with this tattooed on 'em. *drool* Yes, the shading and the halftones are well done.